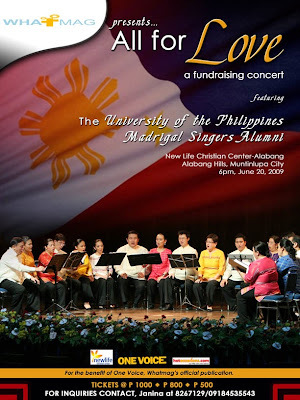 You are all invited to ALL FOR LOVE, a fundraising concert featuring the University of the Philippines Madrigal Singers Alumni conducted by Dr. Renato Jose. This will be on June 20, 6pm, at the New Life Christian Center Alabang. Presented by Whatmag Inc. in partnership with New Life Christian Center Alabang. Proceeds will go to One Voice, a nondenominational Christian magazine. Ticket prices are at P1000, P800 & P500. For inquiries, please contact Janina 09184535543, Pam 09064204406, Edward 09178592092. Or you can also contact me (this site owner) for ticket inquiries. Hope to see you there! WhatMag Inc. is composed of young people who identify with the so-what generation passionately asking What am I here for? What is life, really? What is knowing God all about? The group publishes One Voice, a magazine filled with real life stories of man seeking God and God hounding him; of poems and pictures that tell of man’s heart cries; of articles on different ministries/outreaches/volunteer work that promote real relationship, love, and unity among people with various backgrounds. WhatMag embraces community, giving people a glimpse into a Christianity that really matters.